Orientals are sturdy and sleek in appearance. They have large ears, a wedge-shaped head and a lanky body. Orientals come in more than 300 different colors and patterns. White, red, cream, black, blue, chestnut, lavender, cinnamon and fawn are available solid colors. Parti-colors and smoke colors are also part of the breed’s palette. Orientals can be found in both short and longhaired versions. Shorthair cats are much more common, with longhairs considered to be rare. Orientals have many characteristics associated with the Siamese. They are very active and vocal, and crave attention. They love to play, and enjoy meeting new people, although they usually bond strongly with just one person. Orientals demand a lot of attention, and will meow loudly if they don’t get it. They need frequent interaction with humans, including plenty of play time. Orientals can be a nuisance to cats of less active breeds, and should be paired with other Orientals or breeds that are known to have a lot of energy. 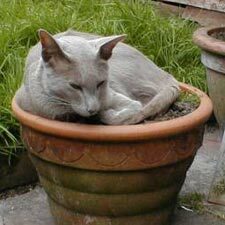 Developed by crossing Siamese with other Russian Blues and Domestic Shorthairs, the Oriental was first developed in England in the 1950s and ‘60s. In the late 1960s, American breeders created their own version of this cat by crossing Siamese, Abyssinians and Domestic Shorthairs. The result is the Oriental, which was first accepted into the Cat Fanciers Association (CFA) in 1972. The CFA recognizes both short and longhaired version of the Oriental as one breed. Meant to have a Siamese body type with a solid colored coat, the Oriental is also recognized by The International Cat Association (TICA) and The American Cat Fanciers Association (ACFA). Both these registries recognize the Oriental Shorthair and Oriental Longhair as two separate breeds.